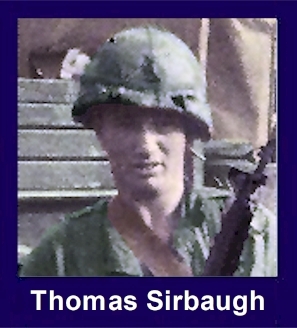 The 35th Infantry Regiment Association salutes our fallen brother, PFC Thomas Edward Sirbaugh (Crosco), who died in the service of his country on October 31st, 1968 in Quang Duc Province, Vietnam. The cause of death was listed as Small Arms/AW. At the time of his death Thomas was 21 years of age. He was from Oakland, Maryland. Thomas is honored on the Vietnam Veterans Memorial at Panel 40W, Line 68. The decorations earned by PFC Thomas Edward Sirbaugh (Crosco) include: the Combat Infantryman Badge, the Bronze Star, the Purple Heart, the National Defense Service Medal, the Vietnam Service Medal, the Vietnam Campaign Medal and the Vietnam Cross of Gallantry with Palm Unit Citation. Thomas was better known in his home town as Thomas Crosco. The following appeared in his hometown newspaper. Services for PFC Thomas Crosco, 21, Mt. Lake Park, who was killed in South Vietnam October 31, were conducted yesterday at 2 p.m., from the Rosedale Pentacostal Church, Oakland. Rev. Roy J. Riffle officiated and interment was in the Garrett County Memorial Gardens. Full graveside military honors were accorded by an Army detachment from Indiantown Gap, Pennsylvania. Thomas recieved two Purple Hearts.